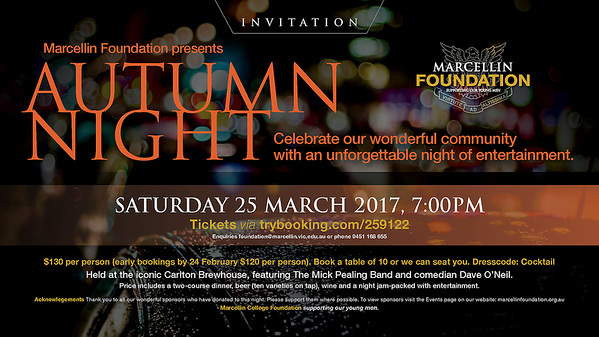 I would like to let you know about our upcoming major Fundraising event, Autumn Night, which we are hosting at the Carlton Brewhouse, cnr Nelson and Thompson Streets Abbotsford on March 25. Everyone in our Marcellin Community is welcome. There will be plenty of laughs with special guest, Dave O’Neil, and the dance floor will be lit up with the legendary Mick Pealing Band. All proceeds from this event will go to the St Marcellin Champagnat Bursary Fund. It’s the perfect occasion to celebrate the beautiful time of the year that is, Autumn in Melbourne.